This house at Archibald and Feron in Rancho Cucamonga is often decorated. 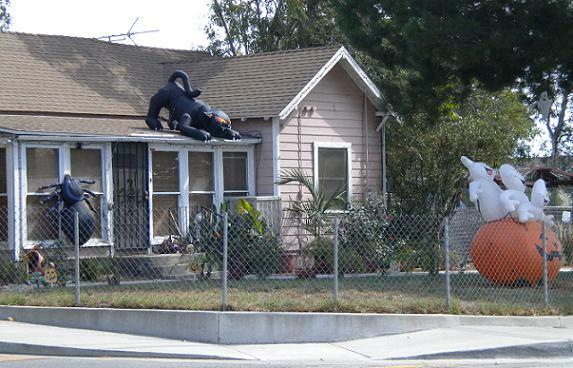 For Halloween, it’s adorned with ghost-riding pumpkins, a panther-sized black cat and giant spiders. Sorta unrealated note but still a Rancho thing, Farrells Ice Cream Parlor is coming to Rancho Cucamonga. Pretty sure it was mentioned here a week or two ago or maybe it was a small item in your column. The correct answer is “Ghostbusters! !” What did I win? And thanks for the earworm. Farrells is having a hiring event this Tue Wed and Thur from 2:00 to 7:00 each day. It should open sometime next month. This info was in Bulletin yesterday. If the opening at Mission Viejo is a pre-cursor then lines will be VERY long to get in. We waited over 2 hours to get in but it was worth it though I would not every time. No they do not take reservations (unless you book a party). Last Friday, I was at the Verizon store which is next door to the vacated Macaroni Grill building. I looked inside the empty building to hopefully see some Farrells decor, but it looks like they are just getting started on the remodel. They still had plenty of exposed studs and plumbing. Maybe they’ll make their anticipated opening date, and hopefully the lines will be shorter than the one I was in for the iPhone! For another unrelated note, Hobby Lobby looks like it’s almost ready to open in the old Mervyn’s building. They have been putting in the store fixtures and are stocking the shelves with merchandise. Nice to see a couple of vacated buildings being filled for new business! Who you gonna call for this house? Looks more like Terminix or Raid would help, than dialing 555-2368. Did you know that Ray Bradbury has a Halloween Tree dedicated to him at Disneyland? It is in Frontierland across from the shooting gallery, and it is spectacular at night.